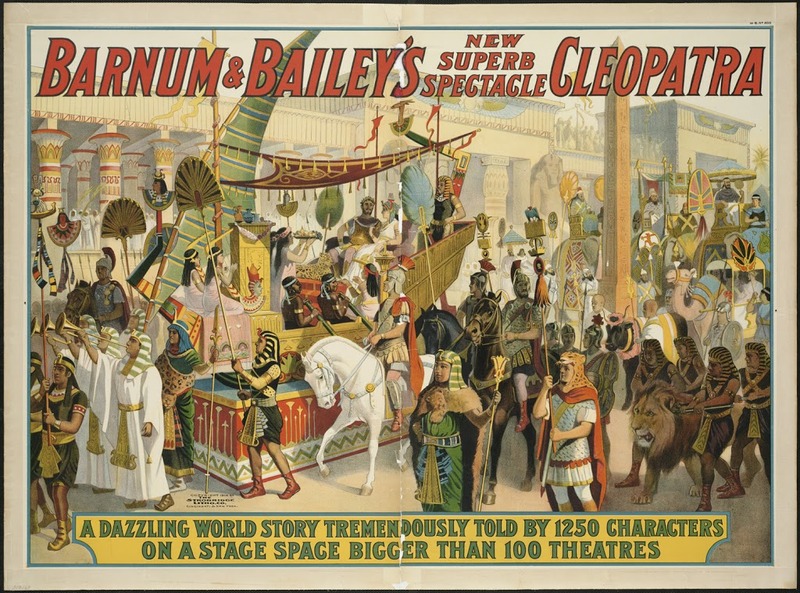 The famed Barnum & Bailey’s presented an elaborate Cleopatra-themed stage show during its 1912 season, featuring over 1,500 performers. The show had debuted just the week before at Madison Square Garden. Certainly some of its stars — perhaps Cleopatra herself? — participated in the March 1912 suffrage event. This struck me as particularly odd this morning, having read last evening all about some odd events from a hundred years ago, March 31, 1912, involving the Barnum & Bailey circus troupe, in town to perform at Madison Square Garden (back in its Madison Square location). The female stars of Barnum’s traveling show decided to throw their support behind the suffragist cause — and the newspapers could barely keep their laughter in check. Seventy-five women employed by America’s most famous circus organized an afternoon suffrage rally and invited the press to the world’s first ‘circus suffrage society‘. How indeed could reporters resist a group of comely acrobats and horse wranglers, presenting their cause on the site of caged animals? It was meant as a solemn pronouncement; reporters mocked it. “They Organize As Man-Eating Hyena Grins, Elephants Trumpet‘, went the Tribune headline, as the circus’s publicity agent “solemnly sw[o]re last night with a hand on his heart that the meeting was a real, honest-to-goodness suffrage meeting.” [source] This was Barnum territory, after all. Although the great showman had died many years earlier, perhaps after decades of chicanery and misdirection, nobody could take a Barnum photo opportunity with a straight face. But it was a serious endeavor, led by petite circus rider Josie De Mott (pictured at left) and acrobat Zella Florence. 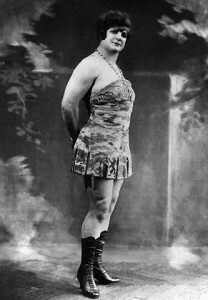 Included in the audience were animal trainers, wire walkers, ‘hand balancers’, dancers, acrobats and even a few strong ladies, including the renown Katie Sandwina, ‘the female Hercules’ (pictured below). 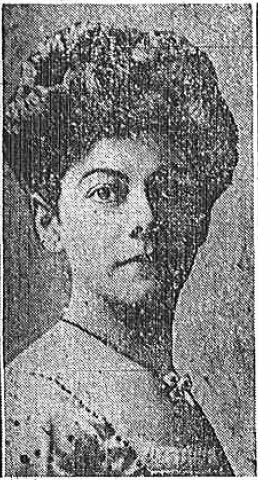 Not in attendance, however, were key members of the mainstream suffrage movement — notably Brooklyn socialite Inez Millholland and the movement’s de facto leader Harriet Stanton Blatch, the daughter of Elizabeth Cady Stanton. Mrs. Blatch, the New York Times noted, was having tea with her fellow esteemed suffragists at their 46 East 29th Street headquarters. (It should be noted they were only a block away from Madison Square Garden!) However, perhaps recognizing the value of a traveling suffragist show, they did deign to send a representative named Beatrice Jones. Clearly flustered by the appearance of the press — the society ladies of the suffrage movement did not consider a circus ring an appropriate political venue — Jones repeatedly asked the ladies if they were serious, then dispensed advice on how to conduct themselves as standard-bearers of the roving suffragist cause. At one point, the male half of Barnum’s husband-and-wife riding act stormed in and dragged his partner from the meeting. The crowd assailed the interloper with boos and hisses. The ‘proper’ suffragists acquiesced and eventually did meet with their more flamboyant sisters over tea the following week. 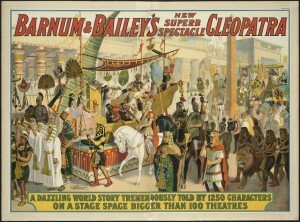 The society activists marveled at the vigor of the Barnum ladies. “It is because they have so much exercise,” one exclaimed, all the while “looking envious at the at the smooth skins and rosy cheeks,” the Times condescendingly added.